Our chicken liver paté is available at Elizabeth Bradley's cheese stall every Saturday at Carlow farmers market. This paté is made by Henry in our kitchen in Clonegal fresh every week. 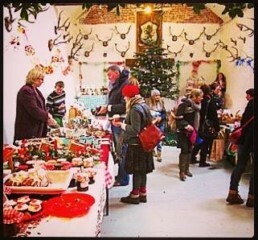 Join us at Huntington Castle for their annual Christmas Food Fair - Sunday 18th December 2016 12 noon - 5pm. Sha-Roe Bistro will be displaying a range of home-made organic produce, just in time for Christmas !